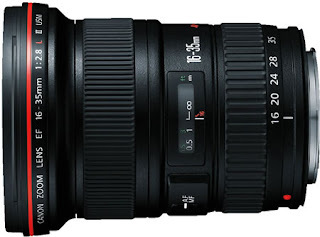 A new Canon EF 16-35mm f/2.8L II USM Lens succeeds the versatile Canon EF16-35mm f/2.8L USM Lens as a high-performance L-series wide-angle zoom lens, specifically designed for improved peripheral image quality. Compatible with all Canon EOS SLRs past and present, it uses three high-precision spherical lens elements and two Ultra Low Dispersion (UD) lens elements to minimize lateral chromatic aberration and to produce superb image quality with excellent resolution and contrast. New coatings minimize ghosting and flare. It is an internal focus design, so the front element does not rotate during focusing and zooming, a convenience for users of circular polarizer filters. The lens is also fully gasketed and sealed for dust and moisture resistance, and it features an electronic diaphragm with circular blades for natural-looking background blur effects.